With the National Enquirer under scrutiny for its longstanding ties to President Trump, the tabloid is formally denying that Trump is involved in its editorial decisions. This issue has come up numerous times in the three years since Trump entered the presidential race, most recently in relation to the tabloid's critical coverage of Michael Cohen. Trump and David Pecker, the CEO of the Enquirer's parent company, American Media Inc., are longtime friends. The Enquirer has consistently trumpeted Trump and criticized his rivals. The tabloid has even been accused of buying and covering up stories that could have hurt Trump. But in a statement on Tuesday, American Media's Chief Content Officer Dylan Howard ruled out Trump's personal involvement. "Donald Trump has never been consulted on editorial decisions; has never requested that a story be written on a given subject, or angled in a certain way; and never requested a story be killed. Period," Howard said. The company said Howard was responding to "suggestions that the White House influences editorial decisions." For example, New York magazine's Jonathan Chait wrote Monday that "the tabloid weekly is not merely friendly to Trump" but is "operated on his personal behalf." There's been widespread intrigue about the tabloid's most recent cover story, which was a broadside against Cohen -- Trump personal attorney who is now under federal investigation. American Media Inc. has a direct interest in the investigation. The search warrant allowed the FBI to seize all of Cohen's communications with Pecker and Howard, among many other material. The Enquirer's headline about Cohen said "TRUMP FIXER'S SECRETS & LIES!" The subheadline said "PAYOFFS & THREATS EXPOSED." While the actual story doesn't contain much new information about Cohen, the cover framing could be interpreted as a message. On Monday, a source close to Trump told CNN's Jim Acosta that Pecker wouldn't have OKed the anti-Cohen framing without the president's blessing. When Acosta asked Cohen if he thought a message was being sent by the Enquirer, Cohen answered, "What do you think?" There could be a more innocent explanation for the Enquirer's pro-Trump coverage: The editors simply have a good handle on what its readers want. Tabloids put a huge emphasis on catchy, sensational covers in order to snag buyers in supermarket checkout lines and other locations. The Enquirer's readership is heavily pro-Trump, and a negative headline about Cohen is naturally appealing to that audience, given all the recent media coverage about Cohen potentially "flipping" on Trump. On CNN's "Inside Politics" on Tuesday, reporter Abby Phillip said the word "lies" on the Enquirer cover is significant, because Trump allies have already started asserting that Cohen might lie about the president. Phillips said, "I think that's a really important word in this case." 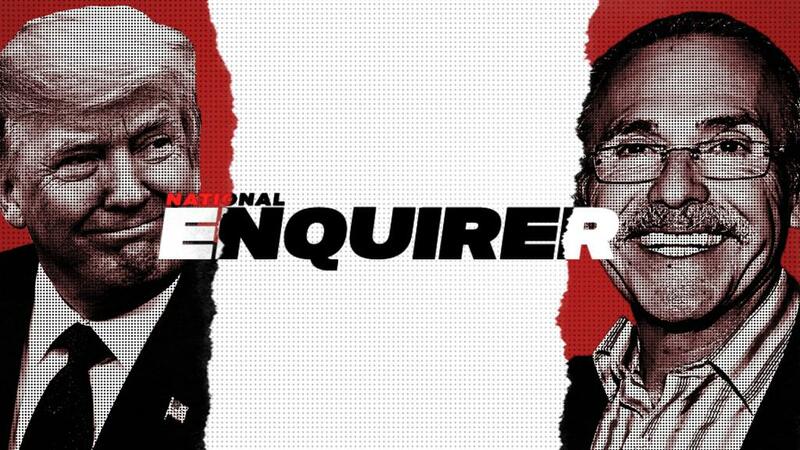 The relationship between Trump and the Enquirer is an ongoing subject of curiosity in the media world. Trump and Pecker have been in the same social circles for decades. They have promoted each other -- Trump once said "David would be a brilliant choice as CEO of TIME Magazine" -- and have socialized at Mar a Lago. While the Enquirer has a questionable reputation, Trump has praised the tabloid. "I've always said, 'Why didn't the National Enquirer get the Pulitzer Prize for Edwards?'" Trump said on the campaign trail in 2016. The Enquirer broke the news in 2007 that former US presidential candidate John Edwards had a "love child." Pecker's company does not dispute that the two men are friends, but it says they do not speak "regularly." That word is subject to interpretation. The New York Times recently revealed that Pecker used a July meeting with Trump at the White House to woo Saudi business. Earlier, The Wall Street Journal and The New Yorker documented how the Enquirer used a tactic called "catch and kill" to bury one of Trump's alleged affairs. "This boils down to friendship. Pecker is taking care of his friends," former American Media spokesman Stu Zakim told CNN earlier this year. Zakim said "AMI has often paid for stories to take them off the market -- i.e., no one else can print it -- to protect David's friends." While "killing" unflattering stories, the Enquirer highlighted Trump's accomplishments and attacked his enemies. Last June the MSNBC hosts Joe Scarborough and Mika Brzezinski alleged that White House aides threatened them by dangled the possibility of a hit piece about them in the Enquirer. Trump claimed via Twitter that it happened differently: "He called me to stop a National Enquirer article. I said no!" --CNN's Jim Acosta and Sophie Tatum contributed reporting.